This new light meter is capable of measuring the light up to 400,000 Lux, which is 8 times higher than the regular light meters. 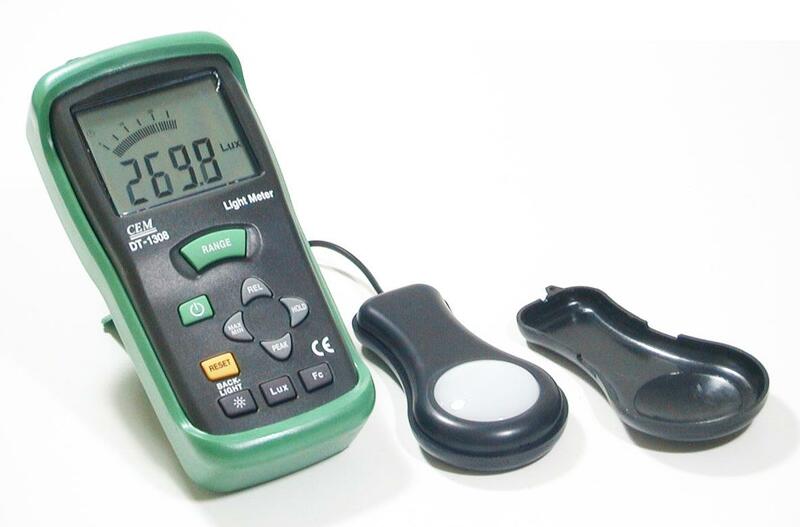 This is a brand new CEM DT-1308 CE certified digital light meter / Lux-fc meter with large 4- digit LCD display and 41-segment analog bargraph. This new light meter is capable of measuring the light up to 400,000 Lux, which is 8 times higher than the regular light meters. It measures in either Lux or foot-candle. Forget about the old analog devices, this newly designed digital light weight device gives you long lasting power with accurate measurement. A FREE heavy duty pouch and a protective cover are also included for carrying your device to the field safely.